Whether sometimes it will be in a mess on your desk in office and complain there is no enough place for storing accessories? - books, calculator, mail, notebook. Please forget them, Here, all problem could be solved by the help of the Wooden-Life desktop bookcase. Why we recommend you to choose Wooden-Life desktop bookcase you? - Clean look and stylish design could match any other furniture at your home or in office. -Can be pushed close together to create a small shelf rack, or pulled apart to nearly double the width for storing more accessories. 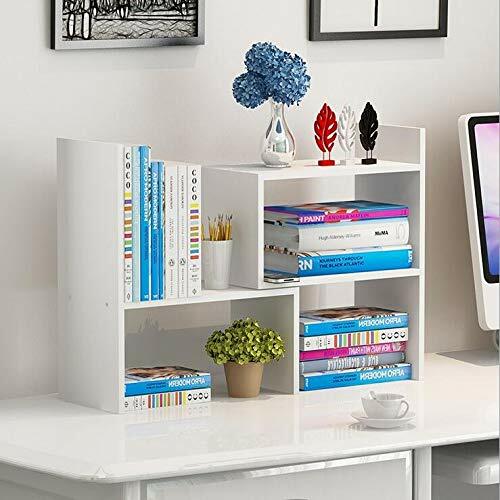 - Saves space and organizer your desktop and workstation to keep your rooms neat organized. - Simple assembly process, arrange the parts according the installation instruction or the way you like. -The small size makes it ideal for any desk, great gift for yourself or your kids. We believe in our product. 100% guaranteed best quality. Perfect desk for paper organizer, spice rack or cosmetics shelf in the office, the kitchen or the bathroom! Click on the shopping cart at the top of the page to give all family member a present! The desktop bookshelf is made of natural wood, definitely non-toxic harmless, eco-friendly. Approximate Dimensions: 13.7 W (extends to 24.8 W) X 14 H X 6.75 D. Assembly required. Features 2 separate pieces which can be put together to become a small shelf rack, expanded longer to storage more accessories,or change others angle fit your needs. Save space on your office desktop and prevent in a mess in the office, kitchen, bathroom or bedroom. Perfect for storing books, office supplies, spice vases, plants, cherished keepsakes. 100% Money-Back guarantee! If you are not absolutely thrilled at it, we will fully refund you. Buy with no any risks! If you have any questions about this product by Wooden-Life, contact us by completing and submitting the form below. If you are looking for a specif part number, please include it with your message.